LeLife Force builds, strengthens, and protects the body because it's an immune and adrenal gland stimulant and toner. It should be used following any illness or traumatic experience that leaves one feeling weak, shaky, or on edge. 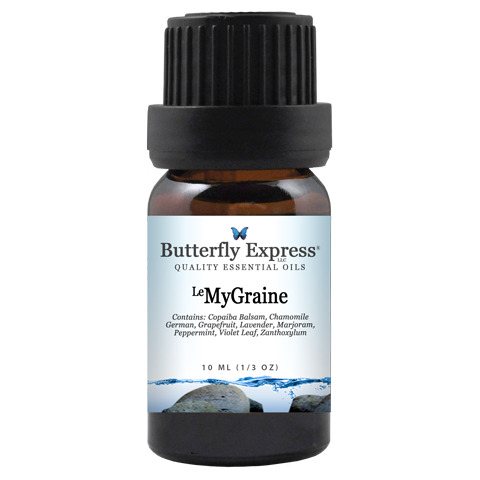 LeMyGraine is used for migraine and stress related headaches with or without accompanying nausea. This blend is also useful following neck injuries and to open the blood supplies to and from the head. LePatches was designed for the repair and healing of damaged tissues, tendons, and ligaments. It is strongly anti-inflammatory, making it effective in restoring motion to inflamed and swollen joints. Coriander is both a gentle stimulant when energy levels are at a low ebb and a sedative in times of stress. It's particularly valuable during convalescence from illness, when energy levels are low and stress is often high. The physical aspects of lemon eucalyptus oil are much the same as other eucalyptus varieties. The high citronellal content of this oil gives it the intense lemon scent and can be used as a mosquito and insect repellent. Ravensara is strongly antiviral. It also supports the kidneys and lymphatic system in getting rid of the "dead bodies" of the invaders. Ravensara has an affinity for the lungs and is useful in chronic respiratory conditions. GENERAL INFORMATION: Insect bites can be dangerous as well as just annoying, but slathering yourself with chemicals may not be a good solution. LeAway is a blend of some of the single essential oils most often used to repel insects. PHYSICAL ASPECTS: Australian Blue Cypress is an excellent respiratory oil. It's very effective at clearing the lungs and supports normal breathing patterns. It would be an excellent choice for pleurisy. The presence of guaiazulene and guaiol makes Australian Blue Cypress anti-inflammatory. It would be useful for such things as arthritis, bursitis and general aches and pains. Australian Blue Cypress was traditionally used to support the body's natural response to irritation and injury. This makes it a good choice for skin irritations and rashes. It has been shown to be moisturizing to dry skin even in a desert environment. It has also been used to repel mosquitoes and other insects. The Boost kit was created to boost your immune system, so you can fight off the nasty bugs naturally. If you catch a sickness, the products in this kit will help you recover quicker. Great to help all ages! This kit contains oils that smell like the great outdoors. These oils have been used successfully to mask the human scent and improve the hunting experience. Essential oils can often be used as basic first aid items. Each oil is bottled in a spray bottle for your convenience. This kit contains all the oils in the Hunters Edge Kit that smell like the great outdoors. These oils were selected from plants that are native to Idaho and Utah. These oils have been used successfully to mask the human scent and improve the hunting experience. In addition this kit contains some basic first aid items you may need while enjoying the great outdoors. Each oil is bottled in a spray bottle for your convenience.